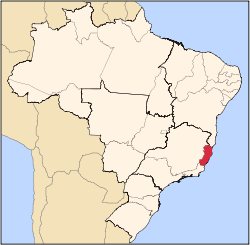 Espírito Santo is one of the states of southeastern Brazil. It is often referred to as "ES". The capital of ES is Vitória and its largest city is Vila Velha. Those who are born in the state are known as "Capixabas", but the more correct word is "Espiritossantenses". The name means "holy spirit" after the Holy Ghost of Christianity. This Brazilian state is in the southeastern subdivision of Brazil, which also contains the states of São Paulo, Minas Gerais and Rio de Janeiro. It is bordered by the Atlantic Ocean (east), the state of Bahia (north), the state of Minas Gerais (north and west), and the state of Rio de Janeiro (south). Espírito Santo's other main cities are Cachoeiro de Itapemirim, Colatina, Linhares, São Mateus and Aracruz. At 46,180 km2 (17,830.2 sq mi), it is about the size of Estonia. The state has many different types of habitats, for example coastal planes, lakes, mountain forest and mangroves. The islands of Trindade and Martim Vaz, 715 km (444.3 mi) east of Vitória in the Southern Atlantic Ocean, are also a part of Espirito Santo state.